Hubby is fond of saying, when his ADD kicks in, that “if you’ve seen one rock, you’ve seen them all.” Granted I have dragged him to Yellowstone, Arches, and Canyon Lands Parks, as well as the Canadian Rockies…all resplendent with rocks in many forms, and I have routed us down nearly the entire Pacific Coast and joyously watched waves crashing against rocks, many of which did look alike. 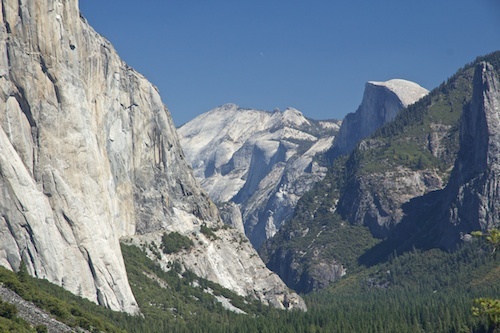 However, Yosemite’s rocks stand in a class of their own. 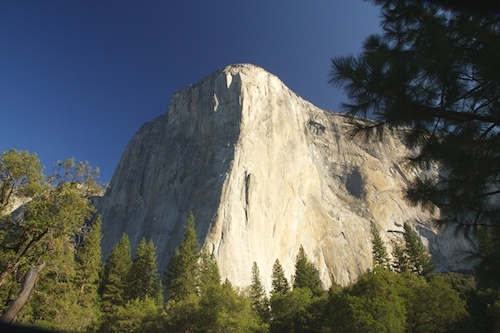 After the breathtaking drive into the park up HWY 140, we turned a corner and there it was El Capitan, the largest hunk of granite in the world, soaring 3000 feet above the valley floor. Awe inspiring. We squeezed our RV into our site and spent several days enjoying the beauty of this Park. 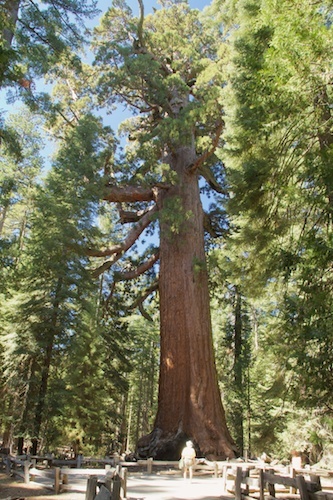 We had seen many coastal redwoods, tall and majestic, on this trip, but they paled by comparison to the Giant Sequoia. The only thing that kills them is gravity, they eventually topple. Resistant to bugs, disease and fire these sentinels have stood watch over this area for thousands of years. On the way from the Mariposa Grove of Sequoia we stopped at Tunnel Overlook (it is just outside a mile long tunnel through the mountain; we were told this tunnel was dug by Chinese laborers with picks and shovels.) THis viewpoint gave us a long look down Yosemite Valley in all its glory. We also stopped at Valley view, down on the Valley floor which gives a similar view from down below and includes the Merced River. 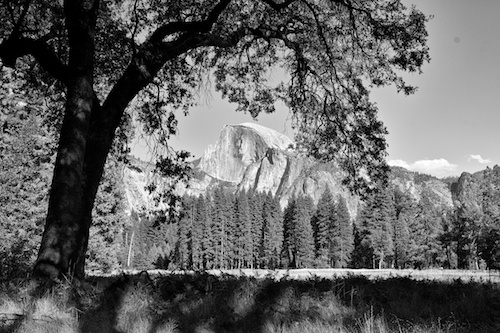 Those of you familiar with Ansel Adams probably know how he loved Yosemite and how beautifully he photographed it. It is difficult to wander its meadows and trails and not be inspired to follow in his footsteps, so I took a four hour class with the Ansel Adams Gallery staff, walking in his footsteps and learning a little more about black and white photography. We happened to be at the park during a full moon and they offered an evening tram ride to see the place lit up by moonlight. It was a unique opportunity. The place glowed eerily as moonlight reflected off granite. El Capitan glowed. As an added treat we were able to see the pinprick headlamps of the many climbers who were bedding down for the night up and down the 3000 foot face of the cliff. It takes several days to climb and they sleep suspended on the rocks wall. Our Ranger guide flicked her flashlight on and off in greeting to the climbers and they answered in kind. It looked like dozens of fireflies flickering high above us. Some people (our husbands) just don’t understand that every rock is different. I love them all! What a very cool adventure to see Yosemite at night with the full moon!! I would love to have joined you. I didn’t realize that the climbers hung there at night but with that distance it makes sense. I had to go on to You Tube to watch them hanging on the side. Gave me the creeps. We loved our time at Yosemite last summer. I need to go back now that we are addicted to hiking and attack some of those trials. Have a great time visiting the rocks!! 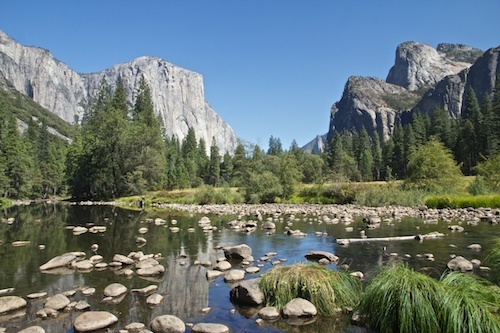 Yosemite is high on my must see list. I’ll need to remember ‘full moon’ for an extra bonus. Beautiful photos! We used to live only four hours from Yosemite and yes I will never get tired of those many rocks. 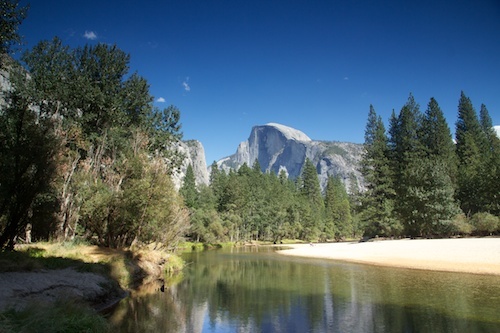 There is nothing like Yosemite! Were you close by when the fire was raging.